Open those windows, break out the Thieves cleaner, and fire up your favorite Young Living diffusers for these awesome Young Living Spring Diffuser Recipes! The Spring forward time change has happened, thankfully. The Spring Equinox is about to happen. And if you’re blessed by Mother Nature recently, you might have already been feeling those springtime temps as well. Here in Colorado, we had 60’s on one day, and a blizzard the next day. Hilarious, right? 90% of that blizzard snow is already gone while the temps stay steady in the high 40s, low 50s. It feels amazing and has me itching to get outside more! This springtime weather has gotten me in the mood to do a deep spring cleaning around the house, and it inspired me to add springtime scents to our diffusers throughout the house, too! Say hello to all these gorgeous Young Living Spring Diffuser Recipes listed individually below! Be sure to bookmark this post to be able to reference these recipes later! 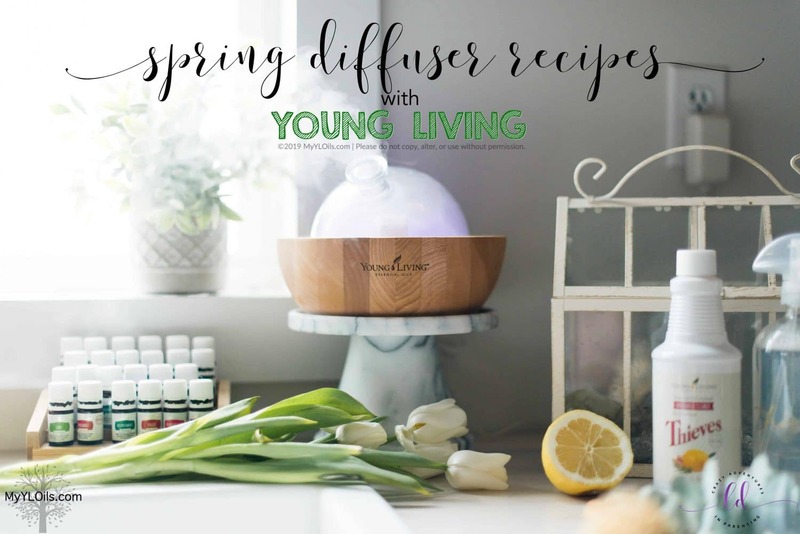 Break out any and all of your favorite Young Living diffusers for this post about all these gorgeous Spring Diffuser Recipes! Chock-full of lovely spring-like motivating and invigorating scents, you’re bound to fall in love with these easy breezy scents wafting throughout your house to help usher in the warmer weather and blooming plants and flowers! I can’t wait to plant flowers outside, and these gorgeous spring diffuser recipes fill me with so much excitement for what’s to come! I hope they do the same for you and your family, too! Jasmine is one of my all time favorite essential oils to use as a perfume! With its rich, sultry aroma, it adds a little bit of flowery romance to the other two clean scents in this diffuser recipe. Eucalyptus Globulus has a clean and refreshing scent while Peppermint’s highly familiar note will invigorate and vitalize you! Paired together in this way, you will love the romantically clean scent they offer! Geranium is another scent that I love to wear as a perfume regularly. Usually, though, I love placing a couple drops on my solar plexus (above your belly button) to help me spiritually add peace and tranquility to my life. Grapefruit and Lemon together offer gorgeous citrus notes that balance the Geranium flower and offer a magnificently refreshing springtime scent for you to enjoy at home or at work! This one stops me in my tracks with its incredibly gorgeous and show-stopping scent! By far my favorite one of all of these! I use Grapefruit in my water every day, but the Grapefruit here again adds a little refreshing citrus flair to the ever-stunning flowery Ylang Ylang scent followed magnificently with Lavender. This spring diffuser recipe offers a peaceful yet flowery romantic atmosphere! This spring diffuser recipe took me completely and totally by surprise! I didn’t expect the citrusy Lemon oil to elevate the earthy and exotic scent of Vetiver, but it did and does! When Vetiver is diffused, it is such an intriguing and interesting scent (which helps you relax and find some rest), but when added to invigorating lemon? It’s incredible how they pair so well together in this way! This incredible spring diffuser recipe combo smells just like a backyard garden! The Lime and Lemon complement the Lavender and Rosemary so beautifully, making this truly a stunning diffuser combination worthy of trying! This one is my second favorite on this list and it’s going currently, I’m not even kidding! You absolutely have to try it! Citrus Fresh is exactly that, the deliciously citrusy combo of Lemon, Grapefruit, and Orange essential oils blended together for a lovely citrus medley! Add to that the luxuriously romantic aroma of Ylang Ylang topped with the ever tart and fragrant Bergamot, you’ve got a heck of a spring fragrance to savor and enjoy this season! Lime’s bright, uplifting, citrus scent pairs immaculately with Sacred Sandalwood’s warm and woodsy aroma creating an incredibly light and airy environment reminiscent of the Hawaiian islands! So luxurious and vacation-esque, if I do say so myself! If you enjoyed these Young Living spring diffuser recipes I’ve shared, be sure to check out my other Young Living posts while you’re here, and please considering sharing this and other posts with others!